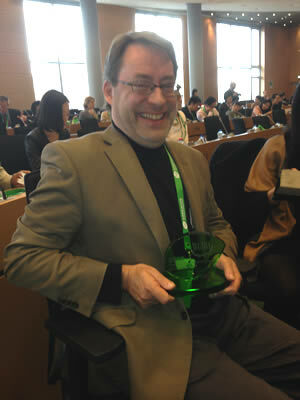 UK expert Professor Martin Charter, Director of The Centre for Sustainable Design ® at the University for the Creative Arts (UCA), was presented with a World Green Design Contribution Award at the World Green Design Forum for his international contribution to green design. The award was made at a ceremony during the World Green Design Forum 2013 in Brussels at the European Parliament amongst over 300 Chinese and European opinion leaders on the 18th October 2013. Martin highlighted “The World Green Design Award represents a growing international recognition of the importance of integrating sustainability into design and development. 80% of a product’s environmental impact is determined at this stage, so thinking about the issues early is essential”. Martin is the founding Director of The Centre for Sustainable Design® (CfSD) at the University for the Creative Arts (UCA) established in 1995. He is a former Visiting Professor in Sustainable Product Design and is presently a Professor of Sustainable Innovation at UCA. Martin has more than 25 years experience in a wide range of topics in sustainable business with particular expertise in sustainability, products, design and innovation. He has been involved in many international expert committees and advisory boards including the World Resources Forum, Eco-innovation Observatory and EC foresight panels on European Industrial Landscape Vision (2025) & Eco-innovation/Eco-industries (2035). Martin will host Sustainable Innovation 2013 on 4th-5th November at UCA Epsom in the UK, the international conference will be the 18th in the series. Other winners of the Award this year include Howard Mark Schultz, CEO and Chairman of Starbucks (US), Guss Keder, CEO of TruEnergy (Belgium), Eero Kalervo Paloheimo, Founder of Eco-city (Finland), Liou Cheng, CEO of China Wood-Plastic Composition Union (China), Stephen Burks, CEO of Readymade Projects (US), Wang Chuanfu, Founder of BYD (China) , Chang Yeh, CEO of Phillips Greater China (China), Bruce C.H. Cheng, Founder and Honorary Chairman, Delta Group (Taiwan), Mark Newton, Vice President of Timberland (US), Ellen Kullman, CEO and Chairman of Du Pont (Switzerland) and Gijs Bakker, Founder of Droog Design (Netherlands). 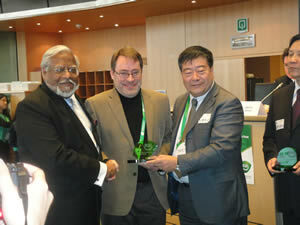 Professor Martin Charter (middle) received the Award at the European Parliament in Brussels from the co-chairman of the World Green Design Forum: Mr. Shi Dinghuan, Counsellor of China’s State Council (right) and Mr. Nirj Deva, Member of the European Parliament (left).